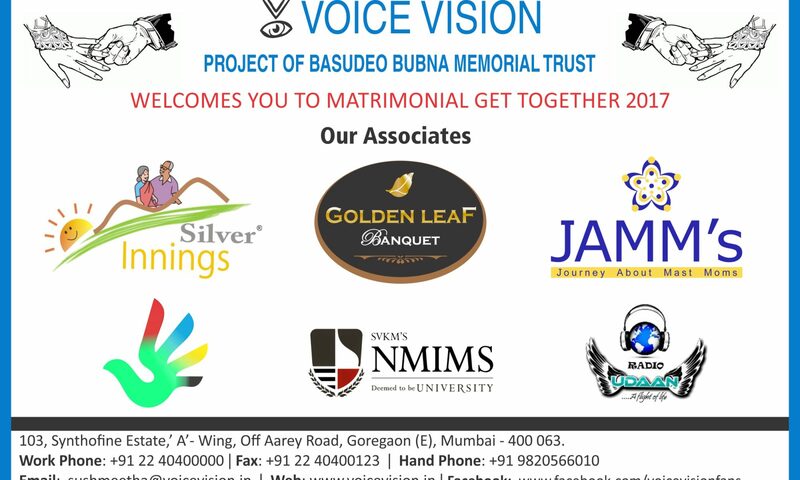 Taking the legacy ahead and believing in the concept “Match the capabilities, rather than matching disabilities” Voice Vision organized their 5th across disability matrimonial get-together on 25th February 2017 at Golden Leaf Banquet hall, Malad west, Mumbai. Participants got their attendance recorded from 10:30 am onwards. All of them were greeted with sumptuous breakfast sponsored by Golden Leaf. Sushmeetha B. Bubna (Founder Director – Voice Vision) commenced the day by welcoming all. She shared the schedule for the day along with few points to be considered while selecting their life partner which included values to consider, likes or dislikes of the other person and explaining that nothing happens in a single day, giving time to each other is important and that everyone has accepted their disability and can overcome it. Special mention to parents was to think inclusive and look towards capabilities of their own child and for others’ child too thereby increasing their acceptance. Mr. Rajit Mehra (Advisory Board Member) & Mrs. Spandana Mehta (Volunteer) then introduced each of the prospects one by one which made them comfortable. NMIMS with Silver Innings volunteers and Saraf College Rotractors helped participants to note down candidate’s names, whom they were interested to meet & interact; while the parents/escorts noted their own choices from the pre-printed data of men and women participants. It was then time for the stirring part of the get-together. Each table had to share either advantages or disadvantages on a situation posed to them. Each one on the table had to contribute including participants, parents, escorts. Three situations discussing its pros & cons made everyone think. Outcomes on both sides of each situation were then shared with the entire audience. It was concluded that no situation is perfect, disability is in one’s mind and adjustments and adaptability can make things simpler. It also opened new horizons of approaching other disabilities and a hope to find a suitable match. Kiran Warankar (Low vision) with his wife Nirmala were present as the role couple for the event. Kiran shared his experience of attending past event of Voice Vision and how the sensitization activity changed his mind-set. As before attending the event he and his family were keenly looking for a sighted or non-disabled life partner for him. But post attending the event and thinking on various situations and its advantages and disadvantages, he decided to marry a visually impaired woman. He also shared how his new thought process was against his parents’ wishes initially and how he went about convincing his parents for accepting his wife in the family in which he eventually succeeded. The newly-wed couple made the moment extremely light, romantic and inspiring for the participants, their parents and escorts. Subsequently came the most essential element of the event; interaction between the candidates over a lavish lunch. Most of the candidates got to meet with prospects of their interest. They had a comfortable chat and gained knowledge about each other. Many participants liked each other and were happy to take this connect ahead for further discussions. Mr. Shailesh Mishra from Silver Inning added to participants comfort by discussing lighter common interest likes and dislikes. Special post event support was extended by Ms. Bubna by offering counselling facility to participants while approaching their likes, counselling their parents and understanding the needs and importance of infrastructural changes. Saraf Rotractors along with NMIMS College, Silver Inning, and other individual volunteers enabled smooth registrations and made the interaction for participants possible. The get-together concluded with felicitation of the venue & food sponsors Golden Leaf Banquet Hall, Saraf rotractors, Silver Innings and NMIMS volunteers, along with other associates such as Radio Udaan, JAMM’s . A vote of thanks was delivered by Ms. Sushmeetha, Founder Director of Voice Vision. The event saw registrations from 122 candidates (68 men and 54 women) out of which 100 candidates attended the event, an increase of 25% from last year. 14% of candidates residing outside Maharashtra had attended the event from places like Delhi, Jaipur, Gujarat and Bangalore. 75% of the candidates were either Graduates or Post Graduates pursuing lucrative jobs. The event saw participation from people from varied disabilities – 43% were visually impaired, 29% were orthopedically disabled, 12% were hearing impaired and 16% had other disabilities. When asked whether the event changed their views/expectations about their life partner after attending the program, with regards to considering partners from varied backgrounds/disabilities, a sample of 100 event attendees rated their experience a 4 on a scale of 1 to 5. Where 1 was the least and 5 was the highest rating. When asked about the various activities planned at the event, ranging from sensitization activity to the Role Couple discussion, a sample of 100 event attendees rated their experience a 4.3 on a scale of 1 to 5. When asked about the various event arrangements, ranging from Venue to the Hospitality of volunteers, a sample of 100 event attendees rated their experience an incredible 4.7 on a scale of 1 to 5. This was possible due to the sensitizing workshop conducted by Sushmeetha Maam prior to the event for all the volunteers. Almost all 100 candidates introduced themselves in front of the entire crowd of 250 attendees, reinforcing their confidence. 70% of the attendees felt that their expectations were completely fulfilled. 25% felt that their expectations were somewhat fulfilled and a few attendees felt that their expectations were unfulfilled. Majority of the candidates felt that this platform was not only a matrimonial meet, but also a place where traditional thinking is challenged, new friends are formed and confidence of the candidates is enhanced. When asked whether Voice Vision should continue holding this event in the future, 100% of the attendees responded with a resounding yes. The event garnered a social media reach to over 2 lakh people, due to an extensive social media outreach program, with the help of Ketto and Thunderclap. The pre-event registrations were improved to such an extent that only 6 candidates were registered as on the spot candidates, allowing complete matrimonial data of all candidates to be properly collated and disseminated among all event attendees. Increase the reach of the event by advertising more prominently and keeping it in different states also. Live by Radio Udaan, internet radio channel for disabled.